Nordmannsfonna is a small ice cap, about 500 m high, which is frequently traversed in the late winter on the way to the east coast. 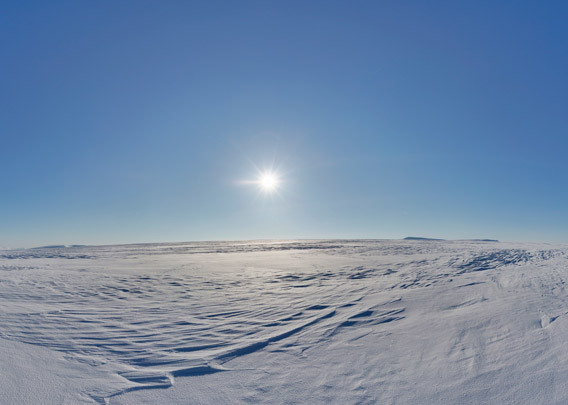 Even though it is only a couple of kilometres that you spend travelling across the more or less even terrain of the ice cap, you get a nice impression of the vast landscapes of an ice cap. The horizon seems to be very ar away. Most people who get to Nordmannsfonna will be out on a snow mobile tour, but this beautiful area can also be part of an amazing but quite demanding ski hike of several days, although snow mobile traffic in Adventdalen and Sassendalen may be annoying at times. 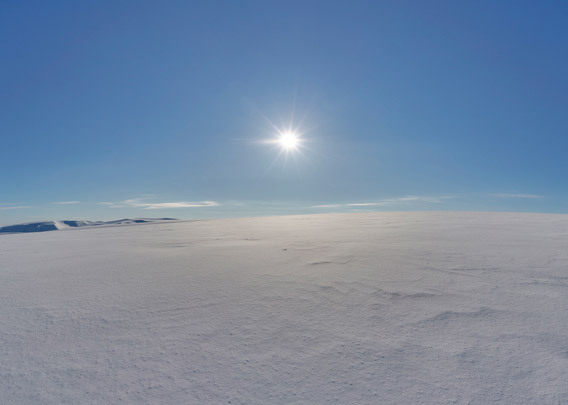 But there are alternative, quieter routes and the infinite spaces on the glaciers towards the east coast, which is what you see in this panorama, are just infinitely beautiful!